The architecture of the State Theatre Centre of Western Australia arises from a dialogue of opposing forces. A sense of darkness and light. A language that is robust and delicate. The building volumes are clearly articulated on the site. The theatres are stacked vertically and located centrally, freeing up space on the site for a large courtyard: an urban oasis and outdoor event space. 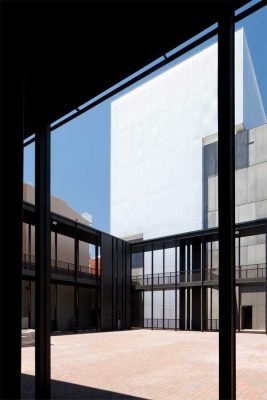 Theatre foyers are located on the perimeter of the site: low transparent volumes that reinstate the urban scale of the surrounding streets and celebrate the activity within. Multiple entries create a permeable, welcoming venue, knitted into the urban fabric. By day, these exterior volumes rest calmly. Dark and robust materials: black metal and paneled concrete, form a protective shell. The layered reflection of glass facades suggests, but does not reveal, what is within. As night descends the volumes begin to glitter and glow. The flytower takes on a sublime light. The foyers, multi-levelled and veiled in delicate gold screens, reveal themselves to the street. A floor of glowing glass reaches out below a suspended canopy – a gesture of welcome. Within this shell of transparent and solid volumes reside the two theatres – each possesses a distinctive personality. 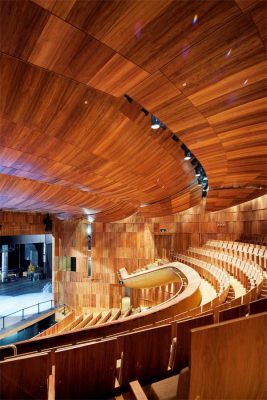 A generous staircase leads to the Heath Ledger Theatre: a curved timber drum that peels away from a paneled concrete shell. Within the drum is an interior world of warm timber and gold hues. 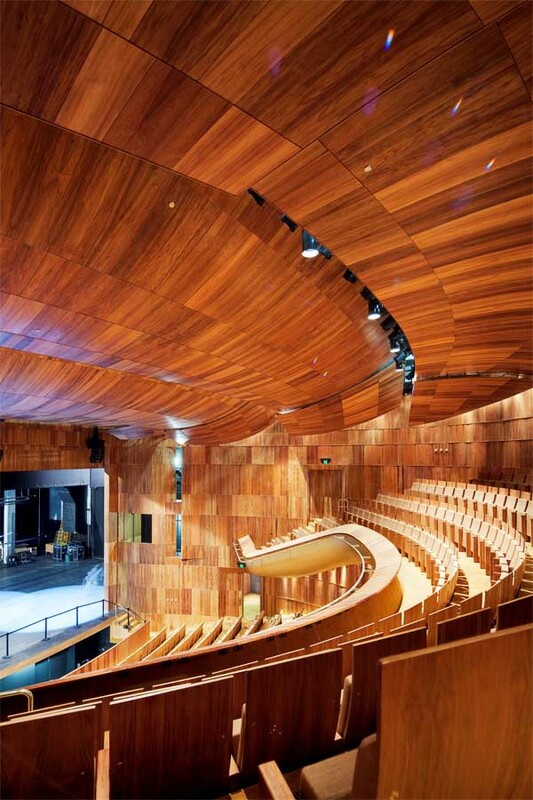 Balcony and stalls seating wrap the curved walls, heightening the sense of intimacy and interaction. Studio Underground is located immediately below the Heath Ledger Theatre, isolated acoustically and structurally. Descending from the entry level, one enters a subterranean world of dark bricks and striated ply panels. The interior space of The Studio celebrates the robust, industrial language of grids and trusses that are a fundamental requirement of flexible performance spaces. 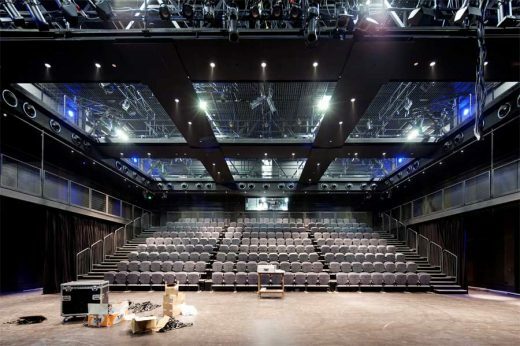 A large opening connects the space to the primary rehearsal room, extending performance possibilities. 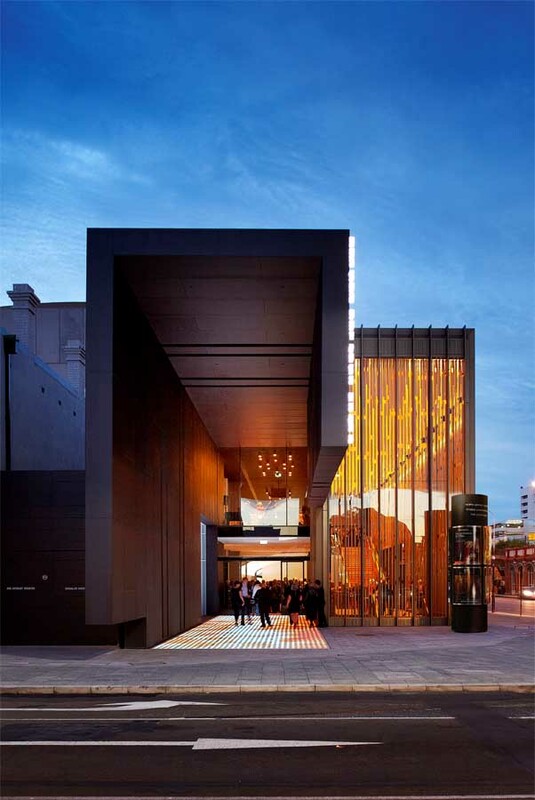 The architecture seeks to impart a spatial drama to the experience of attending the theatre. The solid robust exterior of the building opens and reveals delicately crafted interior spaces that unfold, surprise and delight.